This article will take about 3 minutes to read, and within that timeframe, humans have bought 3,000,000 new plastic bottles. Of those bottles, only 23% will be recycled and the rest will sit in our landfills for 700 years, the time it takes for a bottle to decompose. It doesn’t end there; of the 4 trillion plastic bags annually consumed, 1% will be recycled while the rest flood our landfills and oceans (2). I can throw out statistic after statistic, and while the facts may seem harrowing in the moment, humans can be short-term thinkers. If we don’t see how this issue is directly harming us today (especially on an individual basis), why should we change our lifestyle? Such misconstrued thinking fails to see the magnitude that plastic pollution has on our health and well-being, let alone those of other animals and the earth. Plastic Pollution – Yes, it affects us too! 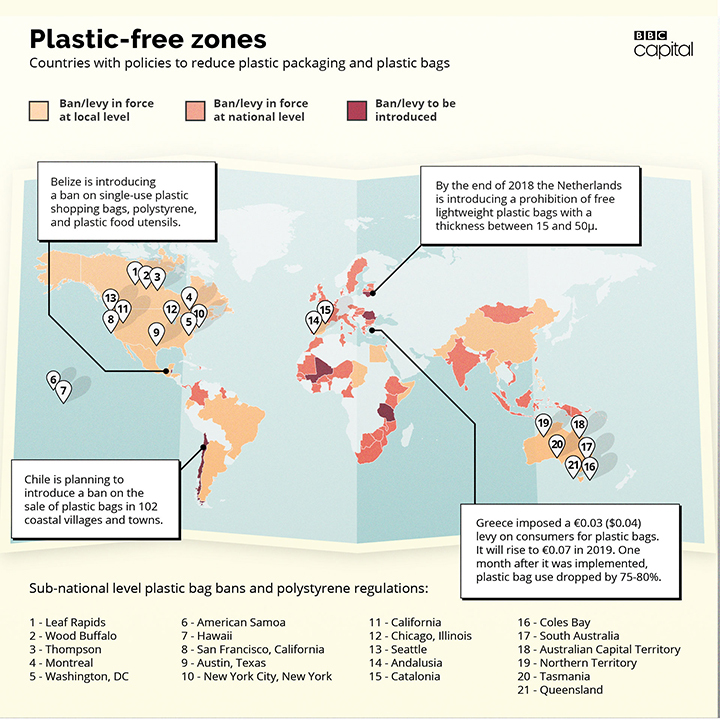 As displayed in the photo above, plastic garbage patches cover vast parts of our shorelines; by 2050, our oceans will contain more tons of plastic than tons of fish (3)! One effect that this poses to our health amounts to the ocean plastic that moves up the food chain, a process called bioaccumulation. Since humans are higher up in the food chain, we therefore consume higher concentrations of plastic content and toxic chemicals (4). 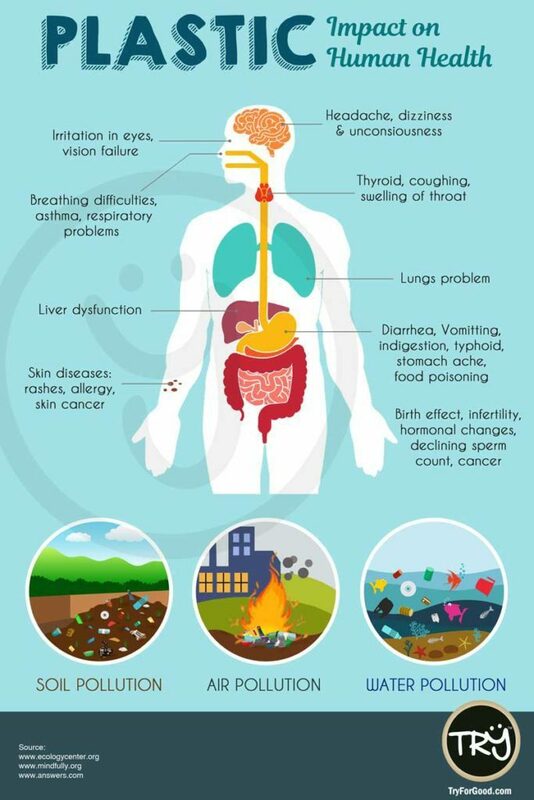 The infographic below depicts the effects this can have on our bodies. 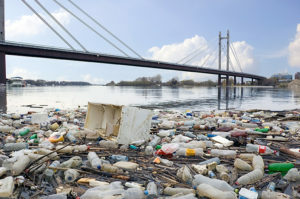 Not only does plastic pollution harm marine life and humans, it also harms the fishing industry, aquaculture industry, tourism, recreation, shipping, and other economic sectors. In addition, pollution disproportionately affects certain populations more than others, especially those living in poverty (a concept called “environmental justice”). Plastic pollution, therefore, is more than an environmental issue; it is increasingly becoming more an economic and human rights issue (4). Where is all the plastic coming from? Certain industries largely contribute to the world’s plastic problem, some more obvious than others. Marine litter can range from large cargo containers, fishing nets, plastic bottles, to microplastics. Microplastics, whose origins are lesser known, form as a result of the breakdown of larger plastics by UV radiation. As of today, 51 trillion microplastic particles are already within our oceans (6). Clothing & Dry Cleaning – polyester, nylon, acrylic, and other synthetic fibers are all forms of plastic. Machine washing a synthetic article of clothing can release over 1,900 microplastic fibers (4)(7). Cosmetic Industry – Microplastics are heavily contained within personal care cosmetic products, some contain more plastic than the containers that hold the product (4). Food/Drink Industry – Millions of bottles, straws, to-go plastic containers, and other single-use plastics are thrown away every day. Grocery Stores– Plastic bags and food packaging are often single-use and go unrecycled. Human consumerism- The mass consumerism society we live in today makes it easy to accumulate goods, dispose, and then replace. Such a habit has resulted in the average person producing half a pound of plastic waste a day (8). In good news, cities, countries, and companies are taking initiative. What about our part? What can we do? Of course, recycling is more ideal than throwing away. But even recycling has its limitations. 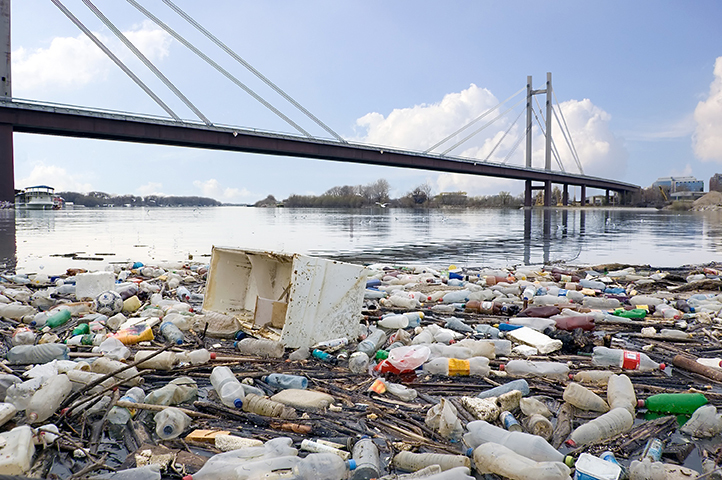 80% of the environmental impacts of bottle manufacturing still occur with recycled plastic. After a process of massive energy and water consumption, recycling only removes 10% of the carbon impact of its original bottle (9)(10)! Therefore, the better option is to strive for zero-waste. A habit takes 21 days to form; let’s turn sustainable habits into a lifestyle!